So you finally decided that you want to take a big step and redecorate your bathroom yourself. 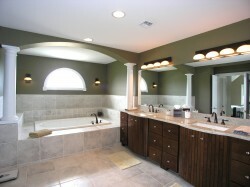 There are lots of different features in a bathroom that need to be considered when taking on the job of redecorating. Aside from the flooring and storage space your bathroom lighting fixtures will probably be the next most important item. The right lighting can make the difference between a drab boring bathroom or a fabulous eye-catching bathroom. The fact of the matter is that there are several different varieties and styles of bathroom lighting you’ll have to choose from. Hopefully the following information will shed some light on the different fixtures available. The first thing that you want to do before purchasing anything is to write out a budget that you can and we’ll adhere to. The reason for this will become apparent when you enter the lighting section of your local home improvement store. You will find yourself easily overwhelmed by the hundreds of different styles, models and makes of bathroom lighting fixtures that are available to you. Before decorating any room in your home you should always have some type of theme in mind. The theme that you decide to decorate with will set the atmosphere that you create in your bathroom. For example if you are trying to create a romantic atmosphere then soft subtle lighting would probably be the best type of lighting to use. In contrast, if you want to create a “Hollywood dressing room” effect you may want to install vanity lights. Vanity lights have several bright light bulbs in them and create the best lighting for putting on makeup, styling hair and various other beautification tasks. Sconces an excellent choice for soft subtle lighting and they are easily affordable. Also inexpensive but practical is your modest ceiling light. It is inexpensive, non-fancy and simply gets the job done. If you really want to impress your friends and family you can even install a small chandelier in your bathroom. The addition of a chandelier will make you feel like you just walk into the chambers of a King but without the expensive price tag. For creating a soft relaxed atmosphere, or to set the mood for a romantic interlude recessed lighting will do the job very well. Whether you decide to go with traditional or contemporary lighting fixtures the choice is truly up to you. You can mix and match the various bathroom lighting fixtures to create your own unique look in your bathroom. The various styles of bathroom lighting will leave you with many options to choose from you are only limited by your budget and your imagination.